Statistically informed ideas on how to make the world work better. Steven Pearlstein has a very nice take in today’s Washington Post on why US politics has become so dysfunctional. At the base of his argument is the idea that the individual politicians are not really to blame – they are trapped in a system that creates strong incentives for them to behave in increasingly polarized ways. Politicians that don’t follow these incentives are usually either not elected, not re-elected, or marginalized and unable to make much difference. The key point here is the distinction between individuals and systems, and how each affects the other. I’ve been meaning to write a long post on this, and I will soon: it’s one of the main principles underlying this blog. For now, though, I want to look specifically at one case of how systems constrain individuals: the case of the US Senate. In particular, I want to look at two aspects of constraint: the rules and laws that structure the Senate, and the culture of how those rules are interpreted. It used to be that if someone wanted to filibuster, he or they needed to actually be up in front of the Senate talking non-stop, sometimes for days (and usually about things unrelated to the bill in question, just to fill time). In 1957, Strom Thurmond talked for more than 24 hours straight filibustering a civil rights bill. 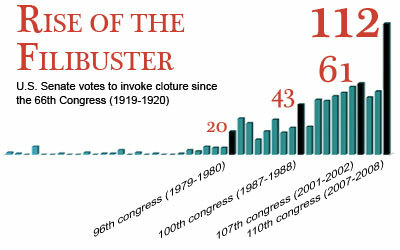 At this point, filibusters were relatively rare, usually reserved for southerners opposing civil rights. But slowly the culture of filibusters began to change. They were used for more and more things. As filibusters became common, the idea of actually standing up and spouting nonsense for days began to seem like, well, nonsense. Why waste everyone’s time with the show, when we could just take a simple vote to see if there is enough support for the filibuster to continue debate? So now, effectively, any group of 40+ senators can (and often does) stop any vote on anything, Votes that fail in the Senate now are almost always votes about whether or not to vote, not votes on things of substance. And the threshold for passing legislation, confirming judges, and so forth has effectively moved from 5o votes to 60 votes of support. This history is well known to many of you, but what is particularly interesting about it is how it demonstrates a clear role for a political culture in shaping national policy. The basic structure of the Senate was established in the US Constitution, and there have been two changes to the rules on the filibuster: in 1917 and 1975. But the last 20 years have seen a marked shift in the political landscape as 60 votes became necessary to pass anything, giving much more power to the minority party. It is this situation that is in many ways responsible for much of the gridlock and deadlock in Washington. The Senate had always (I am told) considered itself a more collegial and intimate body than the House. In this context, many compromises were made across party lines, and there was a culture that preserved the right to debate. In a lot of ways, this is a very good thing. (On the other hand, more cynically, one might ask “why fight with the other party when we’re both being bought off by the same monied interests?” – still true for agricultural subsidies, among other things…) But as the US has become more polarized ideologically, this old rule that had preserved collegiality became a new tool for obstruction. So if you want to understand the system that is the US Senate, you have to understand its rules, and how those rules will create incentives for members to behave in certain ways. But you also need to understand the culture in which those rules are interpreted. The same rules the produced collegiality before produce gridlock now. This principle is by no means limited to political rules and laws. Implementing strict anti-corruption laws that work very well in a developed country may have little or no effect when implemented in a very corrupt country. Traffic laws that work in Germany won’t work in Italy. All rules and laws require a culture of acceptance in order to be effective, and a tough law that people are not willing to follow will usually have little effect. Might societal acceptance of homosexuality drive it extinct?